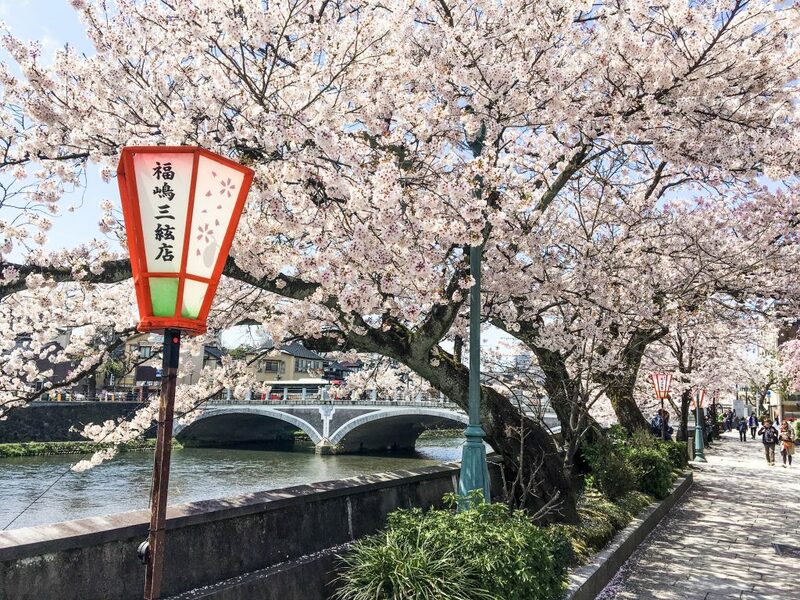 In this article you can find the 26 most beautiful places in Japan, which can make planning your itinerary easier – or perhaps it will even make it more difficult! Japan is one of my favourite destinations in Asia by far. In this enchanting country you can find the perfect blend of history, cultural heritage and modern comfort. When you’re planning a visit, it’s quite hard to decide what the best destinations in Japan are. There are just so many places that are worth your time: historic castles, unusual landscapes, amazing mountains… Not only are there a lot of popular places that definitely should be included in your itinerary, there are also a lot lesser known temples, shrines and towns that are worth a visit. For this post I’ve asked various travel bloggers to share what they think is the most beautiful place in Japan. 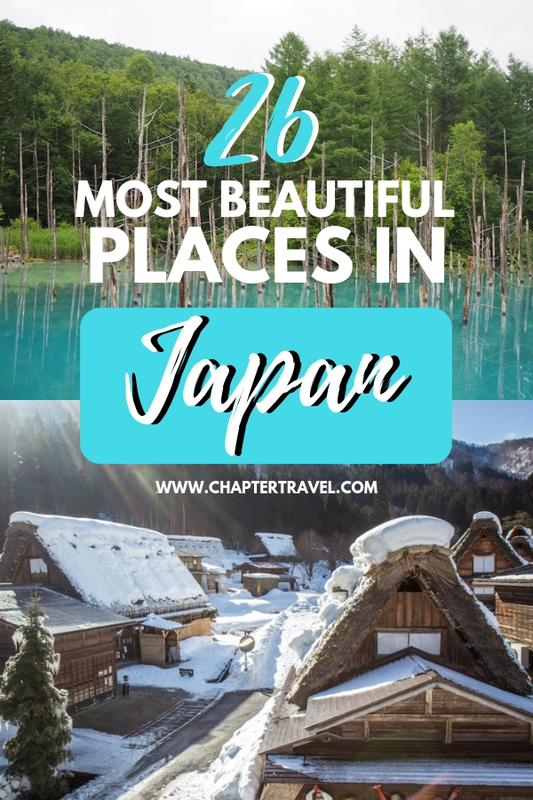 It resulted in this article with the 26 Most Beautiful Places in Japan with both popular and more off the beaten track destinations. Use this list as inspiration for your trip to Japan. Of course, it’s not set in stone that these 26 spots are the best places to visit in Japan. However, they really are some great recommendations that can help you decide where to go in Japan! Have an amazing time! One of the most beautiful places in Japan is definitely Mount Fuji. Mount Fuji is the highest mountain in Japan and one of the country’s iconic landmarks. One of the most beautiful spots to admire Mount Fuji is definitely at the Chureito Pagoda. There is a big chance that you’ve seen this exact location pop up on Instagram multiple times before. 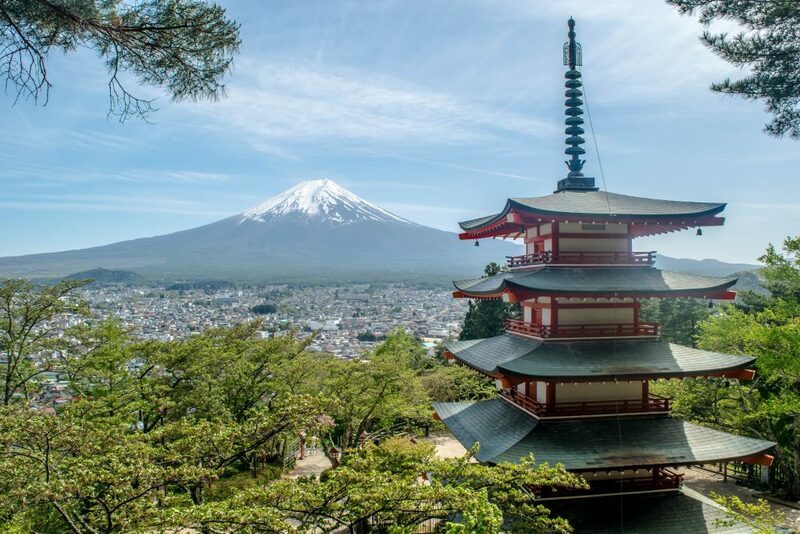 But it’s definitely well worth your time, as it’s even more breathtaking in real life… This pagoda overlooks Fujiyoshida City and has Mount Fuji as the perfect backdrop. Especially in the cherry blossom season in mid April it’s an incredible sight to see. But, we were there just a bit after this season and as you can see on the photo above it was still absolutely gorgeous! Or are you planning on visiting Japan in the winter time? Supposedly that’s the best time to visit Mount Fuji, as the cold weather gives you the highest chance to actually see the mountain. Definitely include Mount Fuji in your itinerary and walk up to the Chureito Pagoda. During our visit there was no entrance fee. Tip: thinking of going to Mount Fuji? Check out this scenic tour to Mount Fuji from Tokyo. Be sure to read our article A Day Trip to Mount Fuji from Tokyo where you can get information about visiting Lake Kawaguchiko, Lake Saiko and the Chureito Pagoda. In this article you can also read how you get to the Chureito Pagoda. One of the most beautiful places I’ve visited in Japan is Jigokudani Snow Monkey Park located in the Nagano prefecture of Japan. 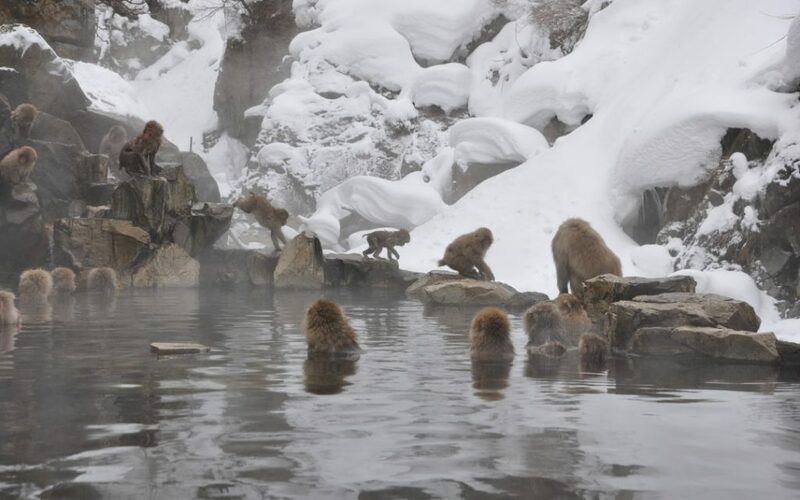 The main attraction at the park are the famous Japanese snow monkeys, a group of Japanese macaques known for their red/pink faces and for soaking in warm hot springs just inches away from visitors. Watching the snow monkeys and their antics is delightful. Some monkeys cuddle, some groom each other, some chase each other and play, and some just enjoy a relaxing soak in the warm water. Reaching the hot springs where the snow monkeys can be found involves a pleasant hike on a 1.6km trail through the beautiful forest. While Jigokudani Snow Monkey Park is open year round, winter is the best time to view and photograph these adorable monkeys as everything is covered in snow making them true “snow monkeys” and the park a winter wonderland. After viewing the snow monkeys, you can explore the nearby town of Yamanouchi and the natural beauty of the surrounding area. Tip: stay at the Jinpyokaku Ryokan. Although this luxury ryokan is pricey it is located a few minutes walk from the park entrance. By Matilda from The Travel Sisters. If you’re visiting Japan in the wintertime, this article with 15 winter activities in Japan can be useful for you too! 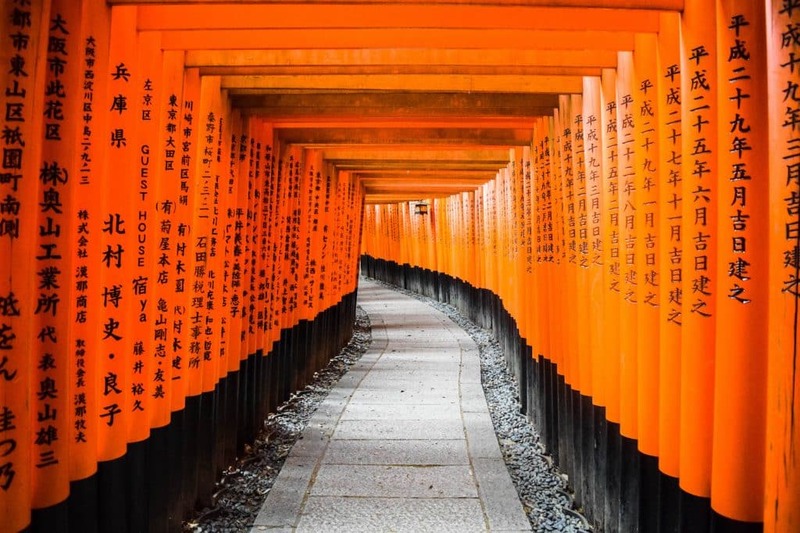 Another beautiful and very popular place that you should definitely include in your itinerary for Japan is Fushimi Inari. It’s really an impressive and important place in Kyoto. The Fushimi Inari Shrine is a very important Shinto, which is the indigenous faith of the Japanese people. When you visit Fushimi Inari, follow the trail all the way up the mountain, where you can have a beautiful view over Kyoto. Take photos of the iconic orange torii gates – which there are thousands of by the way. Even though Fushimi Inari may feel like a tourist trap if you visit it on the middle of the day, it doesn’t have to be that way. It’s one of the most popular places in Kyoto, so everyone wants to include it in their itinerary, BUT you can really avoid the crowds. The early bird catches the worm! Fushimi Inari Shrine is open 24/7 and is completely free, so you can also decide to go really early and catch the sunrise. We went there between 7 and 8 am and it didn’t get busy until 9 am, which gave us enough freedom to take some great photos and the peace gave us the opportunity to really take the place in. Be sure to check our article with 14 Fun things to do in Kyoto. It’s the geography of Shirakawa-go that gives the small village its unique look. High in the mountains of central Japan, two things happened. Firstly, it was virtually cut off from the rest of the country for centuries and so it developed its own style of design and architecture. Secondly, the bitterly-cold winters and heavy snowfall meant the residents built houses with steep roofs about one metre thick made from bundled-together reed-like plants. When you visit today, you’ll still see lots of these traditional gassho-zukuri farmhouses. They are so charming with their rustic wooden frames and thatched roofs. In winter, snow covers them and the whole village looks magical. Many of them offer homestays where you’ll sleep on tatami mats and have a traditional meal around the stove in the living room. Shirakawa-go is a beautiful small village, authentically Japan but also unique. It’s been declared a World Heritage Site because of its cultural value but you don’t need a title like that to appreciate how stunning it is, nestled amongst the mountains and the rice paddies. Tip: Stay at Shiroyamakan, a traditional ryokan with a hot spring. 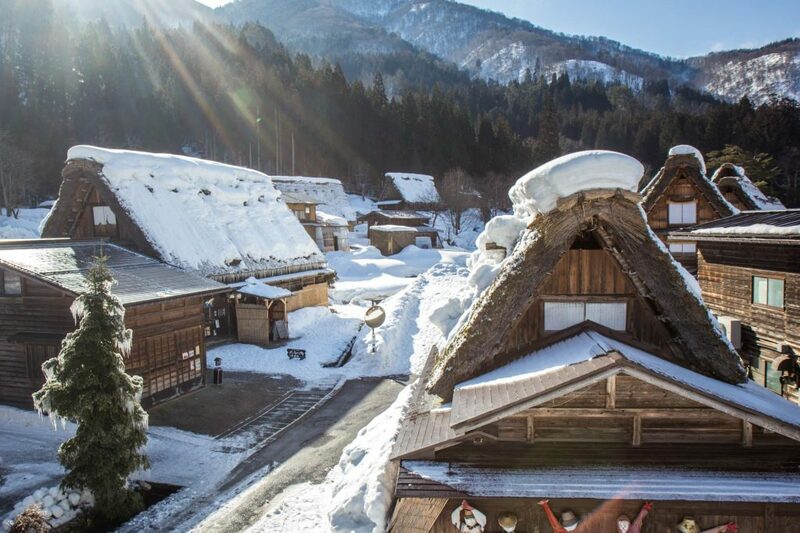 It’s one of the best rated and has a perfect location in Shirakawa! By Michael Turtle from Time Travel Turtle. Tsumago is the 42nd of 69 traditional post stations on the old Nakasendo Trail in Japan. This trail linked Kyoto to Tokyo during the Edo Period (around AD700). The trail was used by tax collectors as a way in which to conduct their business. Tsumago has been rustically restored to the Edo period style and you’ll find narrow streets without cars and no visible power lines. It is the best-preserved town on the trail. Tsumago also maintains the Honjin (principal Inn for government officials) and the Wakihinjin (the accommodation for lower status travellers). 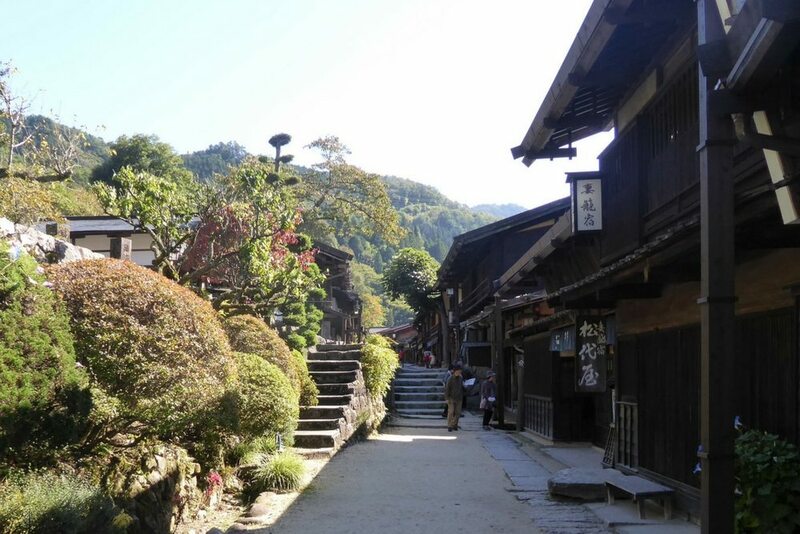 There are popular traditional ryokans in the town, where you’ll really feel as though you have stepped back in time. Tsumago is connected by the Nakasendo trail to Magome, the post town along the trail. 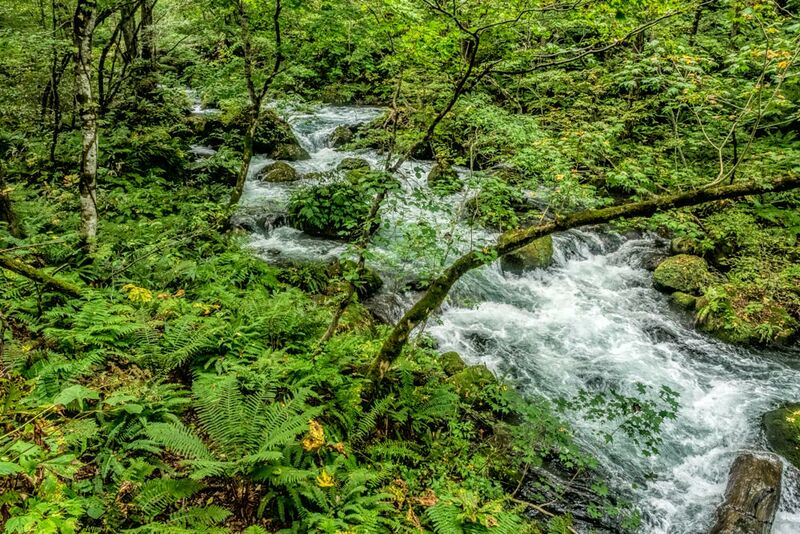 The Magome to Tsumago trail is a popular day hike for those wishing to experience a little of the Edo period trail. By Sarah Carter from ASocialNomad. Miyajima island has been nicknamed the ‘Island of Gods’ and for a good reason. This UNESCO World Heritage site is one of the most scenic spots in Japan. Located just off the coast of Hiroshima, Miyajima is only accessible by boat. As you approach it by ferry, you’ll be treated to some spectacular views. There’s a magical contrast between the deep blue of the sea, the green forest of Mount Misen and the vermilion lacquer of Miyajima’s shrines. 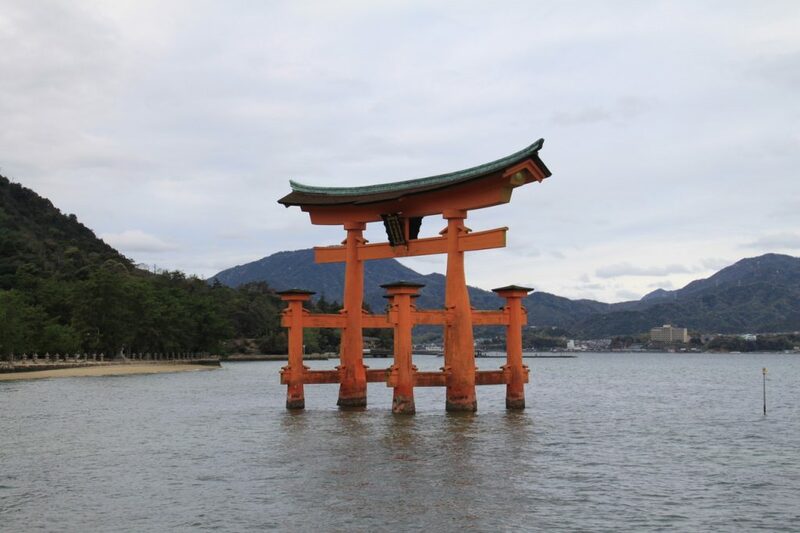 Miyajima’s most iconic attraction, the Itsukushima Shrine’s torii gate stands tall above the water at the entrance to the Itsukushima Shrine. It is one of the most photographed torii gates in Japan. If you visit at high tide, the gate appears to be floating on the water. At low tide you can walk right up to it. Miyajima is also home to many cheeky, white-tailed deer. They love to steal your food and even your maps, and they really take their photo-bombing job seriously! By Cindy from Free Two Roam. Kanazawa, meaning ‘Marsh of Gold’, is a hidden jewel in Japan. As one of the best preserved Edo period city in Japan it has many historical sites to offer its visitors. For instance, start your day by exploring the Kanazawa castle and the nearby Kenrokuen garden. After you can take a walk along side the Asano River and pass by the Geisha teahouse district Higashi Chaya Gai. Kanazawa also offers typical Japanese wooden houses where you can try out one of their specialties: soft ice cream topped with golden leaves. Definitely don’t skip the Nagamachi samurai district with many samurai houses. Kanazawa even has a special ninja temple: The Ninjadera Myoryuji looks plain and normal from the outside… but the inside is full of hidden passages, rooms, doors, floors and booby-traps. Just book a free tour at the tourist office in Kanazawa station, as entrance is limited. 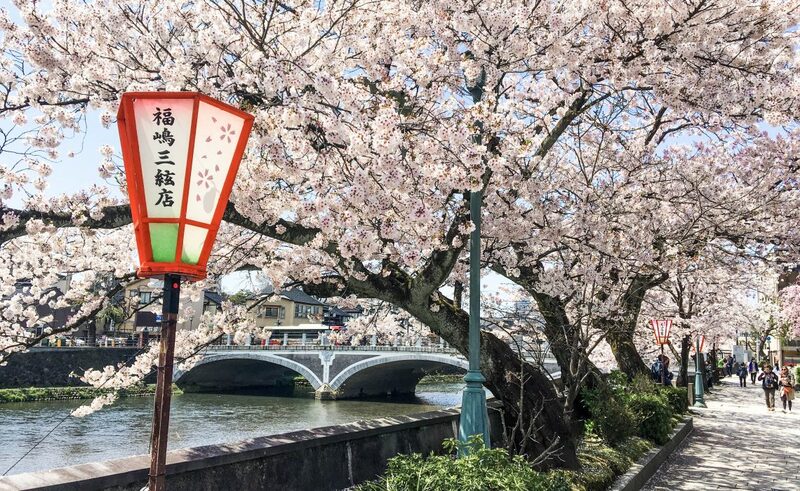 End your day with a walk at the riverbank under the pink bridge Sakurabashi, especially gorgeous during the cherry blossom period. Tip: Kanazawa is perfect for a one-day visit. There is a great hop on hop off system loop bus that stops at or near every touristic attraction listed above and costs 500 yen. If you’re not a fan of DIY, check out these tours to Kanazawa. 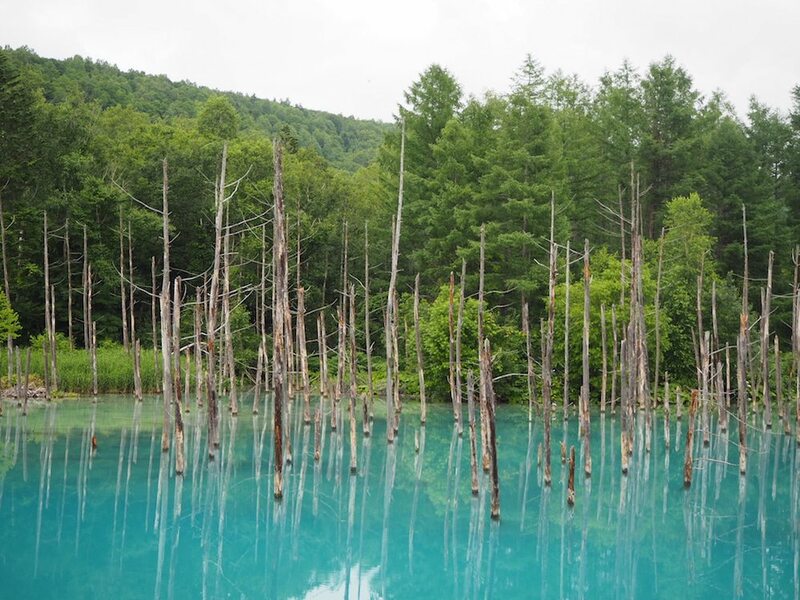 The Blue Pond located outside of Furano on Hokkaido is a truly magical place. The water has a milky blue quality because of magnesium dissolved in the water. You can stroll along its shores following a path through the trees and feel like walking through a part of fairyland. This is not only because of the colour of the water, but also because of the cluster of dead trees sticking out of the pond like witnesses to a time before the pond existed. Even in the high season in summer during the bloom of the lavender fields in Furano the Blue Pond is not too crowded. You can take beautiful pictures from every angle along the path. In winter the Blue Pond changes its face completely. It is the only spec of colour in a world of white and gray. By Lena Scheidler from Social Travel Experiment. We’ve travelled extensively around Japan and found many unique and stunning locations but the Oirase Gorge in the northern Honshu prefecture of Aomori stands out to me for its natural beauty. The best way to experience the area is the 14 km walking trail that runs through the gorge with 14 waterfalls and rapids along it. When we were there in late September it was still very green, just a few leaves showing the first touches of gold but a few weeks later the colour hits and this becomes one of the best places to experience the autumn leaves. The walking trail is a flat and well-formed path suitable for most people of average fitness as a day walk. The area is serene and beautiful but this isn’t a hike deep in the wilderness. The narrow road follows a similar route to the trail, it’s well sign posted and there are some conveniences spaced along it for use by walkers. You’ll need comfortable walking shoes and to carry your own water and snacks for the day. At the end you can catch a bus back to your starting point and if for some reason you want to stop part way just walk out to the road and you can catch the bus at marked stops. By Toni Broome from 2 Aussie Travellers. Okunoin is the largest cemetery in Japan and has over 200,000 graves of Buddhist Monks and important people such as warlords. It’s also an important pilgrimage route through the mountains. It’s set in the forest surrounding the sacred Mount Koya, and although there are plenty of historic temples to see in the area as well, it’s surprisingly the cemetery that is the best thing to experience. Deep in the forest you can walk for a long time among the graves and shrines and it’s easy to get a little lost. It has an eerie feel to the place and a very spiritual one. Amongst it all are small statues of Buddha and other religious symbols that make it feel like your entering a fantasy land. The best time to visit is later in the day as other people start leaving as it gets towards dusk, and you will most likely find yourself alone amongst all the graves in the fading light. Stay until it gets completely dark and use the flashlight on your phone to wander around. It’s creepy, but very beautiful. 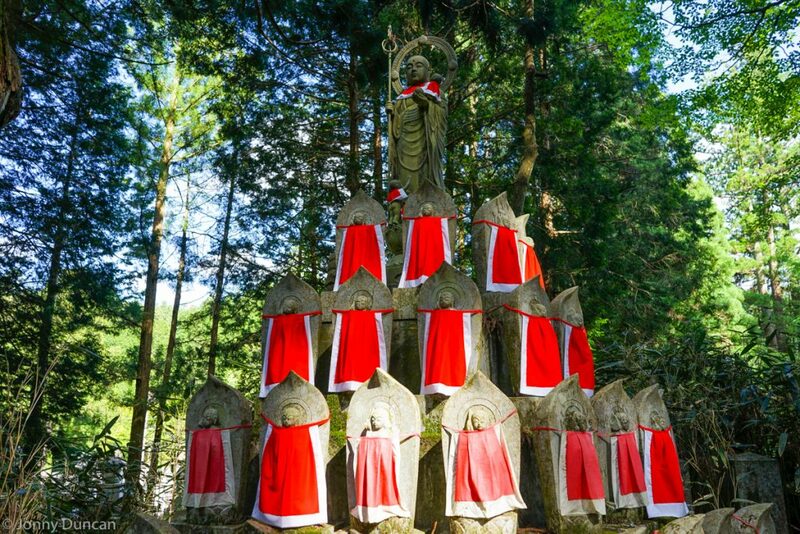 Tip: Okunoin Cemetery is an easy day trip from Osaka or Kyoto. By Jonny Duncan from Backpacking Man. Arashiyami Bamboo Grove is a beautiful place full of tall bamboo trees. If you’ve seen a photo of Kyoto, there is a big chance that you’ve also seen the Arashiyami Bamboo Grove. It was a lot smaller than we initially thought; it’s not more than the path you see on the photo above. But, if you go early and have the place to yourself, it’s definitely worth a visit. It’s possible to access Arashiyama from the Main Street, which is located north of the entrance to the Tenryu-ji Temple. It’s not really necessary to book a tour, since it’s so small and easily accessible. 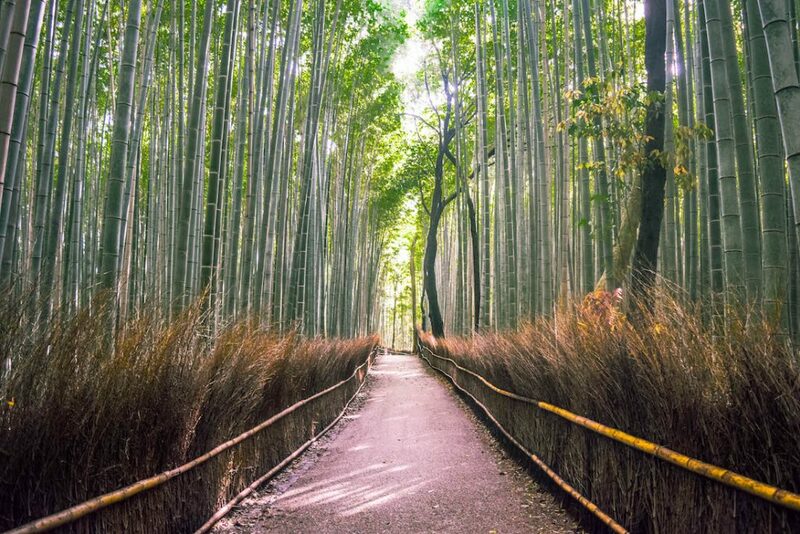 Access to Arashiyama Bamboo Grove is completely free. Located in the highly visited Arashiyama neighbourhood of Kyoto, Gio-ji Temple and Moss Gardens can be considered a hidden gem. But why do travellers so easily overlook it? From the famous Bamboo Groves, Gio-ji is about 3.2 kilometres away making it quite the journey by foot if you don’t have a bicycle! If you decide to make the journey through the lovely backstreets of Arashiyama as I did to get there, you’re sure to be rewarded as these gardens are truly a breathtaking sight. 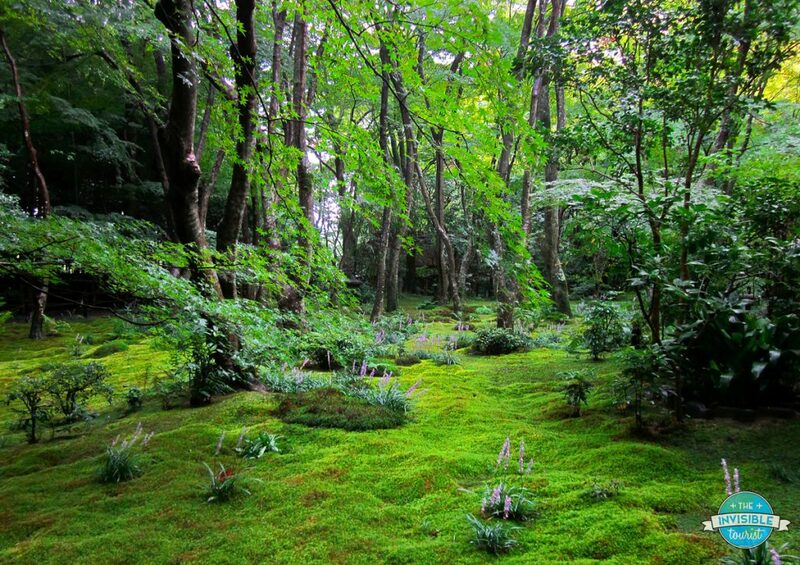 Moss coloured in different emerald shades almost completely covers all ground surfaces under canopies of shady trees, while a small number of stone footpaths help to immerse you in the tranquil setting. Depending on the season, you may also get to see lovely little purple flowers scattered throughout the mossy carpet. As the small temple and gardens are in more of an isolated location in Kyoto, the bonus is you may be lucky enough to have these peaceful gardens all to yourself during your visit! By Alyse from The Invisible Tourist. 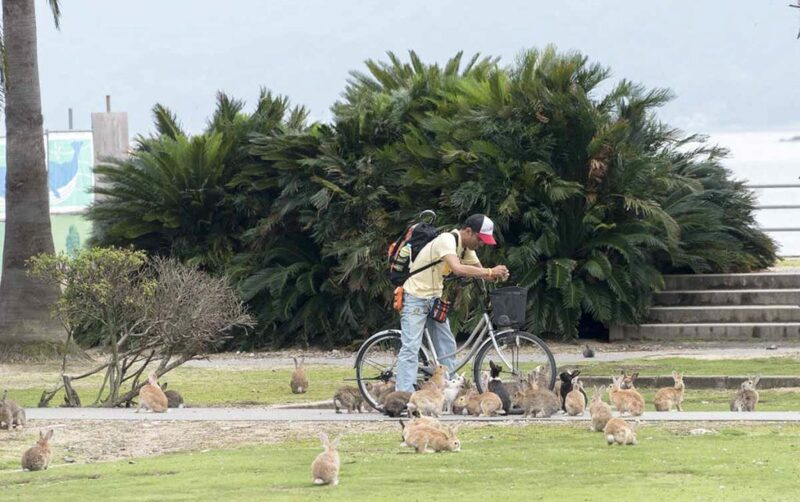 Okunoshima is a tiny island in the Inland Sea of Japan also known as Rabbit Island, because of the thousands of cute and furry residents that call it home. In fact, Okunoshima is not just a super kawaii place, it also has a dark past that makes this island even more interesting. Okunoshima was the site of a poison gas factory, where mustard gas was produced from 1929 until the end of the war. There’s still a small museum where you can learn about the island’s past and see some of the horrific effects caused by the gas. When the factory was open, rabbits were used to test the gas effects. Nowadays, the rabbits living on the island are not the offspring of those ‘test rabbits’, instead they were introduced in the seventies in an attempt to exorcise the island’s dark past. Tip: There’s only one hotel in Okunoshima, but the place is easy to visit as a day trip from Hiroshima! By Margherita Ragg from The Crowded Planet. Japan is well known for its beautiful gardens. We were especially smitten with the Shukkei-en Garden in Hiroshima. Dating back to the 17th century, “Shukkei-en” means “shrunken scenery” and the garden was designed to be a miniature version of Japan itself. As you walk through its paths and over its bridges you’ll see different scenery and terrain that’s mean to remind you of different parts of the country. Our favorite section was the small bamboo forest which we had all to ourselves – a very different experience than in Kyoto! The garden is tucked away in a small pocket of the city that’s slightly off the tourist track, but it’s worth seeking out. 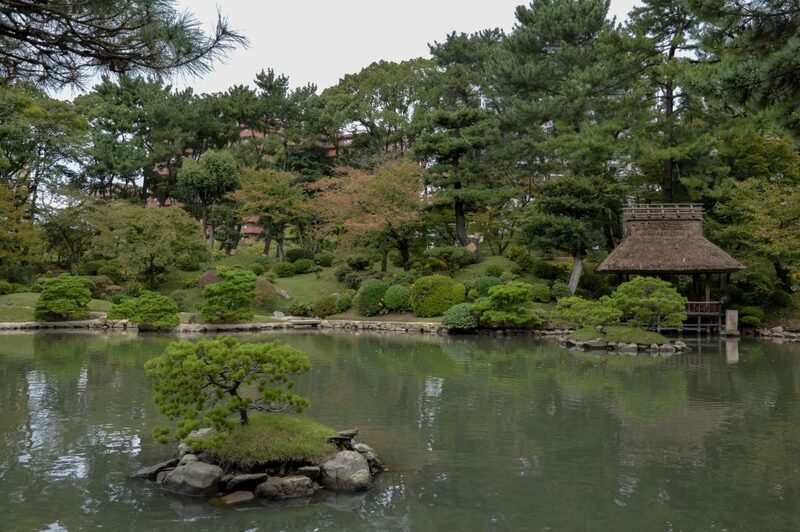 Shukkei-en Garden is the perfect place to find moments of peace and tranquility in Hiroshima. By Sarah Poitras from Travel Breathe Repeat. 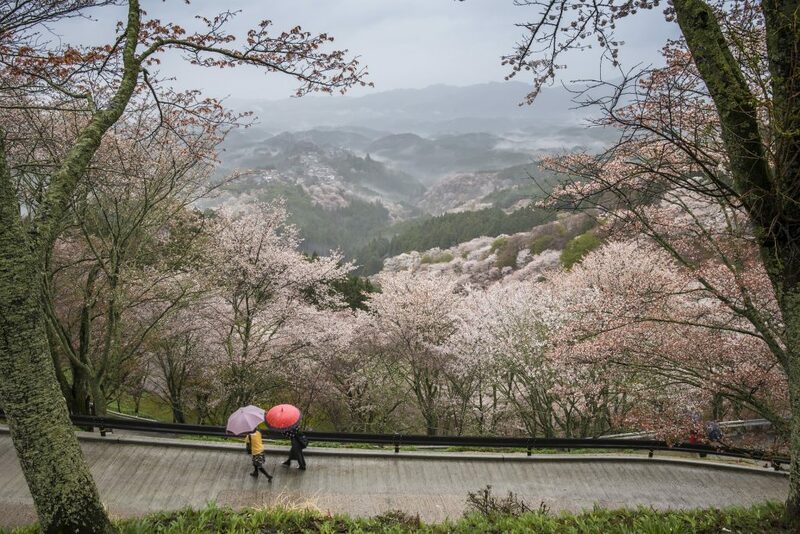 Mount Yoshino in Nara Prefecture is one of Japan’s most famous cherry blossom viewing spots. There are over 30.000 cherry trees to admire around the roads that lead up the mountain and it covers all of the paths. If you want to get the best views of the blossoms, be sure to check out either Yoshimizu-jinja Shrine or Hanayagura Observatory. Next to the beautiful nature, there is also a lot of culture to enjoy. At mount Yoshino you you can also find lots of gorgeous shrines and temples. Furthermore, there are a lot of traditional ryokans where you can relax in an outdoor hot spring. Gion is the most famous geisha district in Kyoto. It’s a place that quickly comes to mind when you think about Japan. In Gion you can explore the Japanese traditional wooden machida merchant houses, temples and perhaps you’ll even encounter a geisha! It’s definitely one of the most gorgeous places in Japan. Tip: Have you always wanted to dress in traditional Japanese clothing? 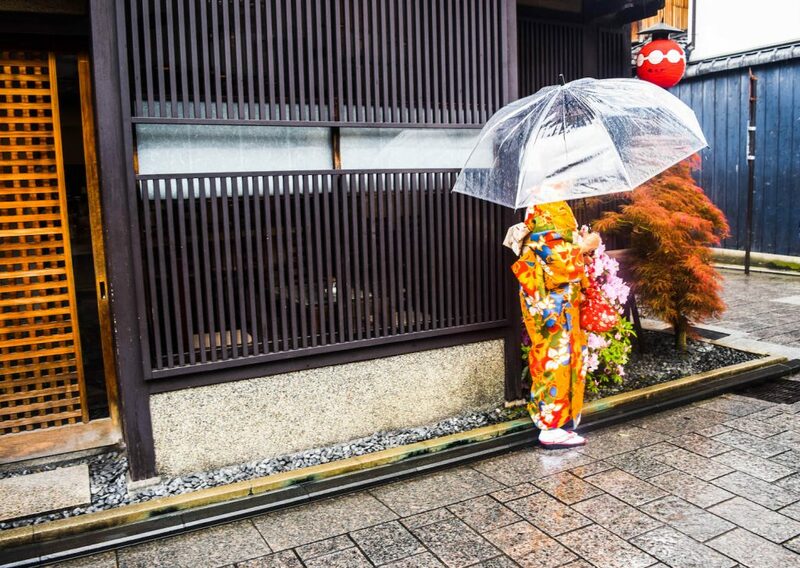 In Gion you can dress like a real maiko, which is a apprentice geiko, and get a photo shoot. Check prices and availability here. One of the main day trips from Osaka is Nara Park. Not only is it absolutely beautiful, there are also free roaming deer everywhere you look. According to the indigenous fait of the locals, the deer are considered to be messengers of god. At Nara Park you can visit the Todai-ji Temple, Kasuga-tasha Srhine, and Yakushiji Temple, just to name a few highlights! At Nara Park you’ll meet some very polite deer, who will even bow for you when they want you to give them food. However, some deer are very aggressive. I think this is probably because we, the humans, are all feeding them. Therefore I would advice not to do so. I think it will only do those animals harm. 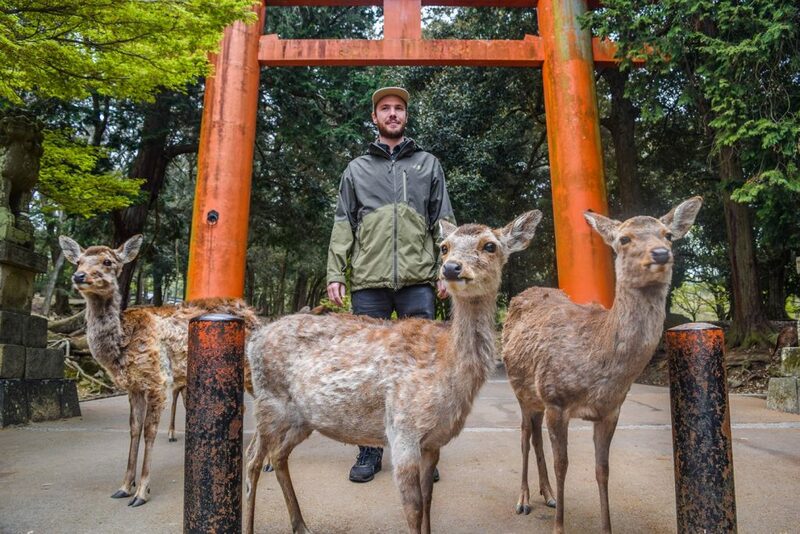 The above photo of Jeffrey with the deer (I think they just formed their own band) was taken without any cookies. Just with lots of patience and standing still. Tip: You can also try on traditional kimono at Nara Park. Kumano Nachi Taishi is one of the three beautiful Kumano shrines. Close to Nachi Taisha is the 133 Nachi No Taki waterfall. This is actually the tallest waterfall in Japan and the original religious site in the area. Nachi no Taki can actually be seen from the Pacific Ocean! It’s definitely one of the most beautiful places in Japan and you should include it in your itinerary. It’s possible to get to Nachi Taishi with the train from Osaka or Kyoto. Tip: read our post with 35 bucket list experiences in Japan that will make your trip memorable! The Osaka Castle Park is worth a visit if you love pretty fairytale-like castles! The mint-coloured details of the castle are so pretty and all the beautiful trees make it so green and lush. Osaka Castle is free to visit (unless you want to go inside the castle) and there are different food stands. 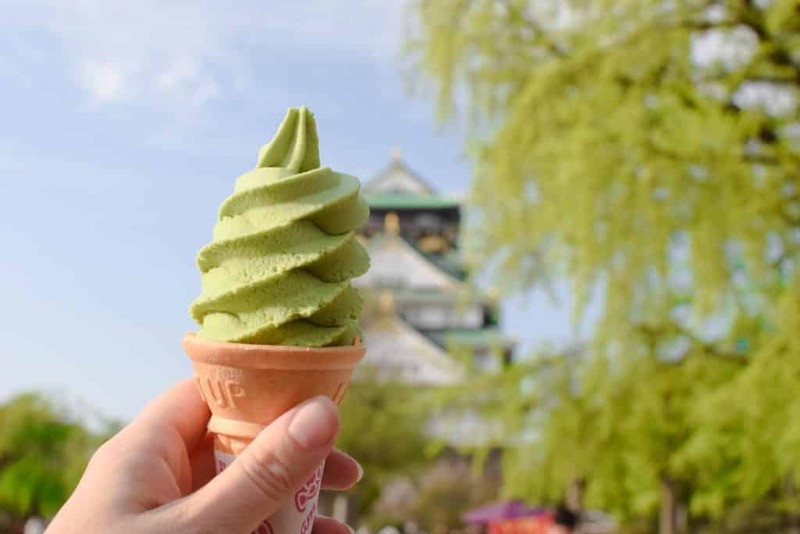 We got a delicious matcha ice cream that fit perfectly with the surroundings. The only thing that was a bit disappointing was the elevator located next to the castle. It ruins the traditional architecture of the castle, but luckily you didn’t see the elevator from every perspective. Are you on a budget in Osaka? Be sure to read our article with 12 free things to do in Osaka. One of the most popular cultural spots in Tokyo is the buddhist temple Sensoji in Asakusa, also known as the Asakusa Kannon temple. Before you reach Sensoji you have to cross a shopping street of 200 meters, called Nakamise. Here you can get typical Japanese souvenirs. Sensoji is one of the most colourful and popular temples in Tokyo. It’s also one of the oldest temples in Tokyo. 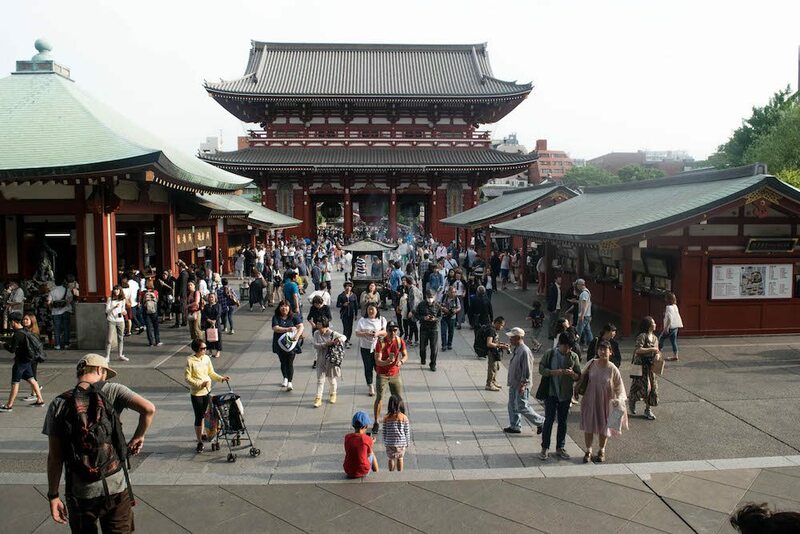 At the Sensoji temple you can find the Kaminarimon gate, the Hozomon Gate and the Asakusa Shrine. The temple complex is big, so you have enough to explore! Another amazing place in Japan is Shibuya Crossing in Tokyo. It’s not necessarily a very beautiful place in Japan, but rather a very interesting and exhilarating one. It’s claimed to be one of the busiest interaction in the world! Sometimes a thousand people cross the Shibuya crossing in one time, all coming from different directions. It’s a cool place to take photos, and we took some great long exposure shots, like the one above. We also took photos from Shibuya from above. This can be done at various points, for instance at the L’Occitane Café, the Starbucks and the Shibuya Excel Hotel Tokyo. Looking for more amazing places in Tokyo? 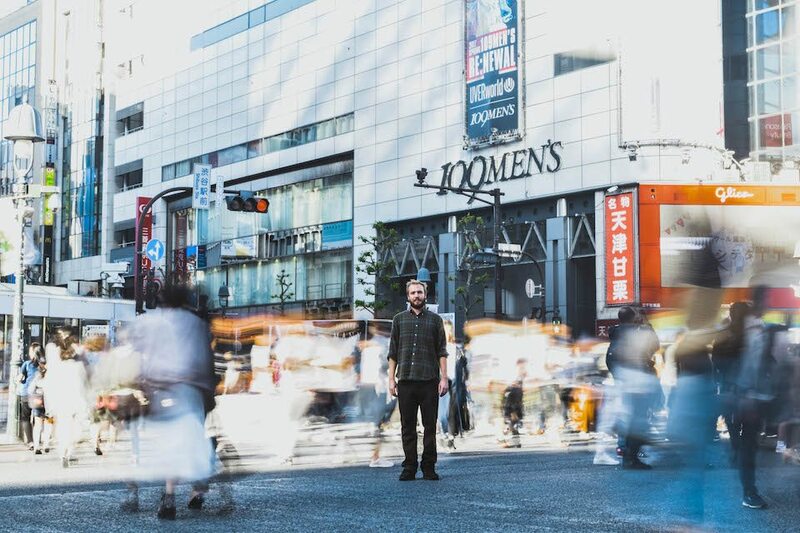 Read our article with 10 fun things to do in Tokyo. Himeji Castle is a beautiful hilltop castle, located in Himeji, a city located in Hyōgo Prefecture in the Kansai region of Japan. It can be reached easily from Osaka or Kyoto. 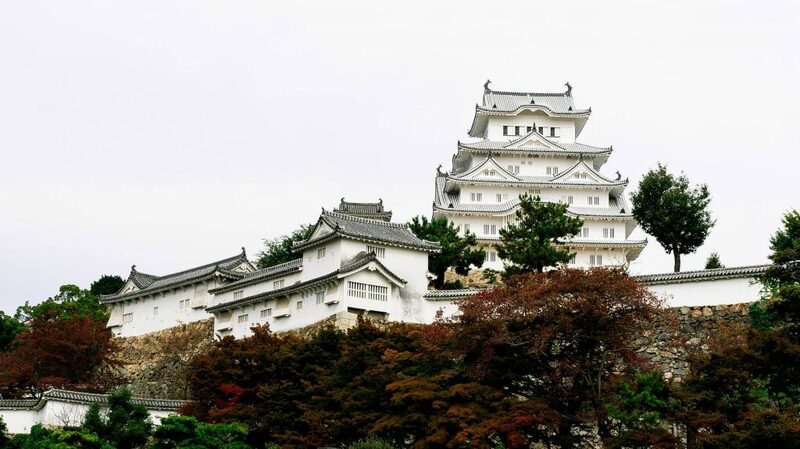 The castle is one of the most beautiful castles in Japan, because of the beautiful simple white colour and is also known as the ‘White Heron Castle’ or ‘White Egret Castle’. The complex has over 83 buildings with defensive systems that date back to the feudal period. The Himeji Castle is also a world heritage site. Unlike Osaka Castle and other Japanese castles, it hasn’t been ebuild due war, fire or earthquake. Therefore it’s known as the finest surviving example of Japanese castle architecture. The Kamakura Daibutsu (Great Buddha of Kamakura) is located in Kamakura, which is in the Kanagawa Prefecture close to Tokyo. Kamakura is a popular tourist destination with many temples, shrines and other beautiful historical monuments. 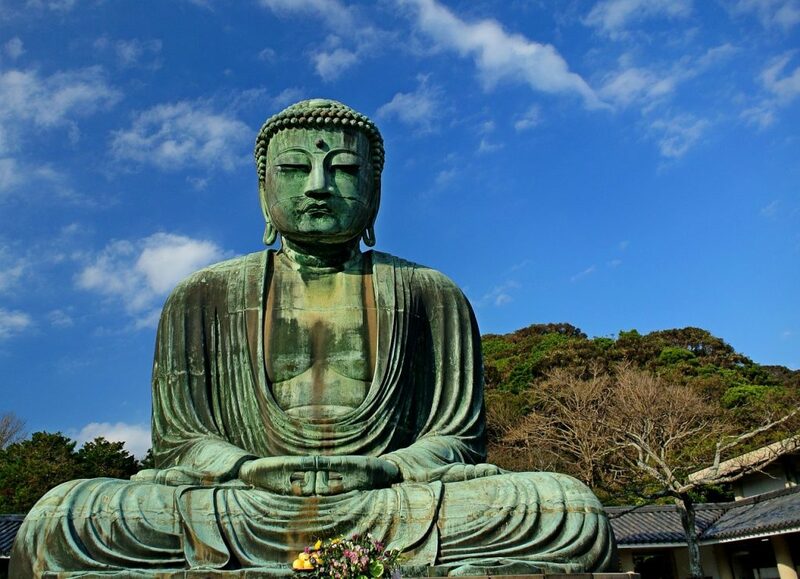 The great Buddha of Kamakura is a beautiful copper statue that stands on the grounds of Kotokuin Temple. It’s a very impressive statue, standing on a height of more than 11 meters. It’s quite unique for Japan that the statue sits in open air. If you’re looking for a quiet temple in Tokyo, visit the Gotokuji Temple. It’s located in the quiet area of Setagaya Ward of Tokyo, away from all the business of the city center. 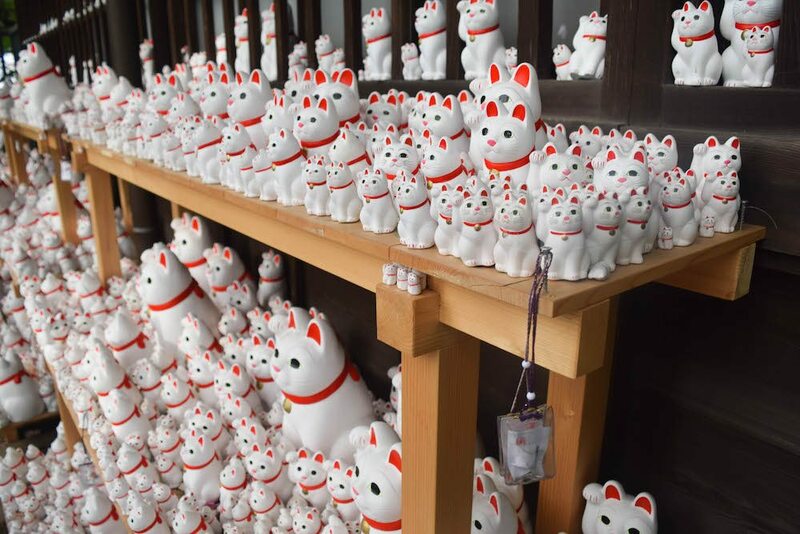 Here you’ll find hundreds of beckoning cat statues. If you wonder why there are so many cat statues at Gotokuji, it’s because there is a famous story that Gotokuji is actually the place where the beckoning cats were made for the first time. Next to all the cat statues, the temple complex itself is also beautiful and pretty big too. It’s definitely worth a visit if you’re looking for a more off the beaten track place in Tokyo. Shikoku, located in the Seto Inland Sea, in Japan is one of the four major islands in the country. It’s one of the lesser known islands too, which is perfect if you’re looking for a unique destination in Japan. 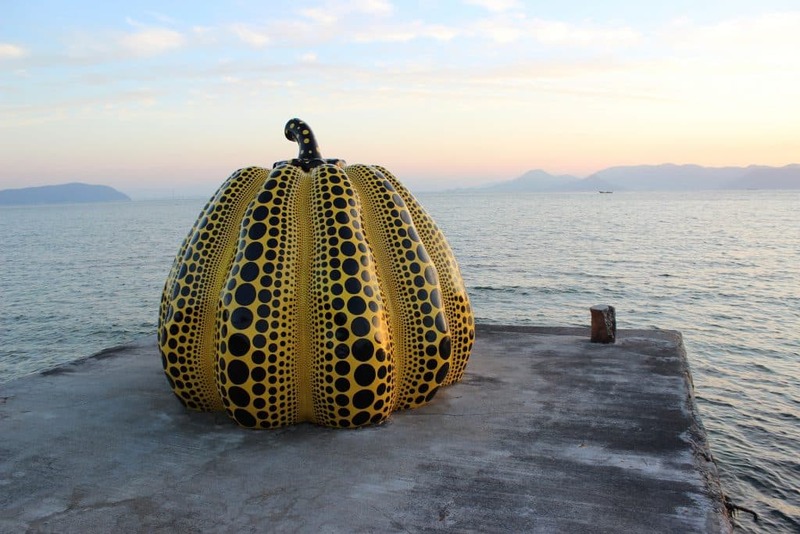 At Shikoku you’ll find the art island Naoshima, together with the iconic Pumpkin Sculpture by Yayoi Kusakuma. Noashima is known or its modern art museums, architecture and outdoor sculpture. Furthermore, you’ll also find beaches and it’s a perfect laid-back destination in Japan. If you’re an art lover, definitely include this in your list! The Tateyama Kurobe Alpine Route is also known as the roof of Japan, it passes through the dynamic scenery of Mount Tateyama in the Japanse Alps. The route connects Toyama City in Toyama Prefecture with Omachi Town in Nagano Prefecture. This route can be accesses from the major cities in each prefecture. In spring the Alpine Route is actually carved through the snow, which looks really cool (pun intended). If you want to experience these snowy walls, the best time to visit is in June, when the walls can be over ten meters high. During the summer you can go for sightseeing, climbing and nature walks. 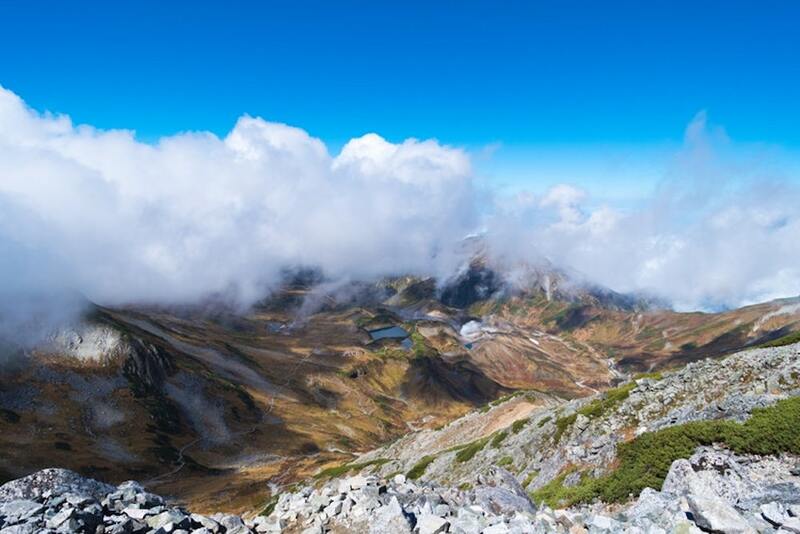 Here you can find more information about the Tateyama Kurobe Alpine Route. That were the 26 most beautiful places in Japan! These were not only the most typical things to do, as this list included quite some unique places to visit in Japan. There are more beautiful spots to visit, but these spots are definitely a great start. What a valuable post! My boyfriend and I both agreed the other day that Japan was next on the bucketlist and posts like this just fuel the wanderlust! Fushimi Inari Shrine looks amazing as does those blue pools, so so much to see here I’ve no idea how long we’d need!